BHOD Leberdemain - Now You See It, Now You Don't! A ticklish task confronted our Depot explosives experts recently when dangerous fuzes for anit-tank mines had to be destroyed. Of World War II vintage, the chemical fuzes became super-senstive through age and several hundred thousand of the mines required new type fuzes. Demolition of the dangerous cast-offs was accomplished in 34 days without an accident, following days of planning and effecting precautionary measures. Shown in the picture at the left are 288 of the dangerously jettery contraptions, covered with 200 pounds of nitrostarch, wired for detonation by remote control. The picture at the right, taken immediately after the explosion, at the exact spot shows the devastating power of the innocent looking "starch". Colonel H. G. Hamilton recently received the following letter from the Office of the Chief of Ordnance in Washington. "It is advised that the production during the modification of M6 series Mines, recently completed by your Installation, reflects credit on you, your staff and other operating personnel." "In addition, the disposition of the M600 Mine Fuze without an accident indicates the thorough training given the personnel on this project." "It is gratifying to this Office that you and your personnel have fulfilled your mission by exceeding the requested production without decreasing safety standards and you are hereby commended for a job 'well done'. BY COMMAND OF MAJOR GENERAL FORD: (signed) J H. HINRICHS, Brigadier General, U.S.A."
Behind this letter lies a dramatic story of the incalculable value of the combination of experience, ingenuity and safety training. In keeping with the policy of equipping the United States Armed Forces with the best products which our industrial ingenuity can devise, the Ordnance Corps is continously at work in the field of military explosives. In general, one of the most important characteristics of a military explosive is that it must have sufficient inherent stability to withstand long periods of storage, transportation and rough handling in the field, and yet be of suffient sensitiveness to enable it to function instantly when needed. Since improvements are constantly being made, much ammuntion held in war reserve would become obsolete and a complete loss of it were not possible to replace older type components with newly developed ones. In order to save the taxpayers' money and to keep ammunition stocks at a peak of efficiency, the Ordnance Corps utilizes the facilities of its Field Service installations. Such an installation is the Black Hills Ordnance Depot, which is an extremely important link in the vast chain of munitions supply. Very recently a review of stocks of anti-tank mines revealed that many of the extremely sensitive chemical type fuzes had reached a point of danger by reason of their long continued storage and resultant increase in their sensitivity to detonation. A decision was reached by the Office Chief of Ordnance to remove the hazardous fuzes and to replace the with entirely new modern fuzes which would completely rehabilitate the stock of anit-tank mines. In issuing the work order to the Black Hills Ordnance Depot, the Ordnance Corps brought forcibly to the attention of the local command that the renovation project was extremely hazardous and fraught with danger of a high potential. Since the work was of a nature which had not heretofore been accomplished to any great extent, the method of renovation was left to the ingenuity of the Depot personnel and, while approval of methods finally divised would be had from the Office Chief of Ordnance, the responsibility for the safe completion of the entire operation rested with the local command. Colonel Hamilton, a veteran of a quarter century in the service, called in five of his key men and between the they could muster an aggregate of 93 years experience in explosives. Even with this array of cumulative experience, the task at hand taxed the ingenuity of these men who had devoted years to the problems of munitions. After many hours of discussion they weree ready to tackle the first phase of the Herculean project - the removal of the "jittery" fuzes from nearly half a million of the heavy M6 anit-tank mines and replacing them with the new type fuze. The job of modification of the mines was taken over by R. E. Orbaugh, Chief of Renovation and Demilitarization. Employees assigned to the job were painstakingly instructed in their duties, apprised of the hazards along the operating line and methods of circumventing them. A three-eighth inch steel shield with a one and one-half inch thick bullet-proof glass was constucted to protect employees from blast effect and fragments while removing the fuzes. A quarter inch steel shield was placed between the cab of the truck and platform body to protect driver and helper when transferring fuzes from operating line to magazine storage or demolition grounds. The old fuzes were packed in boxes made of two inches thick with two-inch thick dividers so that each fuze was packed separately. 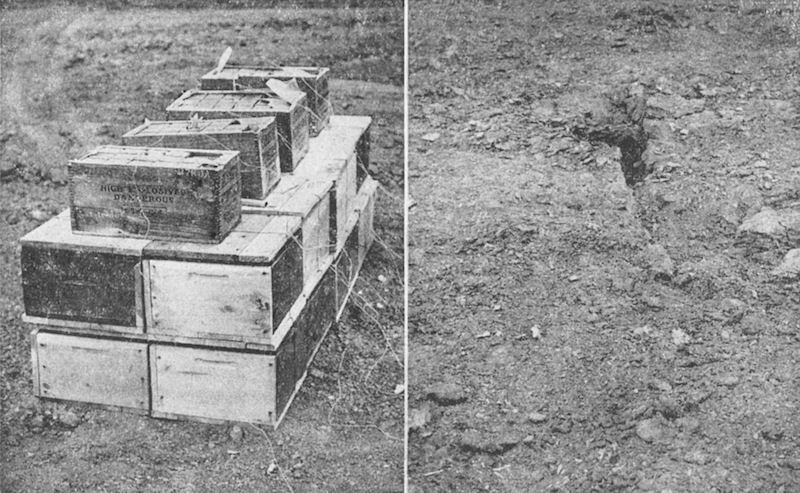 This method of packing, which prevented propagation of explosion in the box if one of the fuzes functioned after packing, was the result of many experiments. After many type of boxes had been tested at the demolition grounds, it was found that this box was strong enough to satisfy the safety requirements for a safe package. After ironing out dozens of minor problems, the modification really started gathering momentum until an average of 4000 mines were processed in a 3-shift day. The problem of destroying the dangerous fuzes was placed in the lap of Dave Calvert, Chief of the Ammunition Inspection Office. After many experiments, in which various types of destruction were tried, an average of 1000 per eight hours was the best that could be accomplished. Calvert then studied the feasability of destruction by demolition and found that this was a safe and money-saving method. Close to 400,000 fuzes were destroyed by this method, averaging 11,370 fuzes for eight hours. Two hundred and eighty-eight fuzes were destroyed at one time, with 200 pounds of nitrostarch which was so wired that detonation was accomplished by remote control. When every possible safety measure is employed, personnel given extensive training, and men with "know-how" do the supervising, hazards just cease to be hazards. 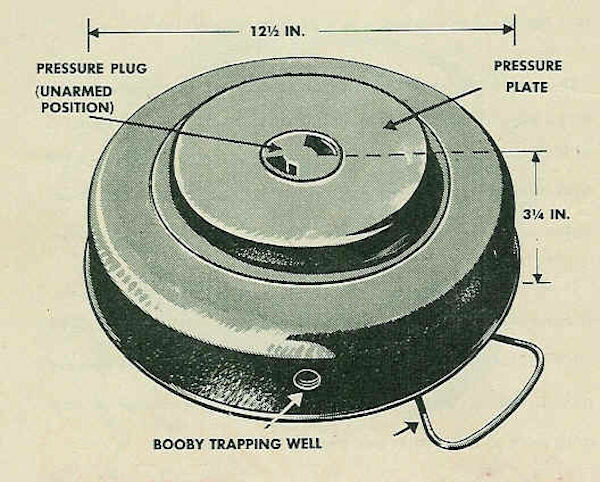 The M6, M6A1 and M6A2 are a series of metal cased circular anti-tank landmines produced by the United States, they were superseded in service by the larger M15 mine. The mine is normally painted olive green and has a large central pressure plate. In the centre of the pressure plate is an arming plug that has an arming lever with three settings: ARMED, DANGER and SAFE. The pressure plate rests on a concertina like structure, which when enough force is applied is compressed. Compression results in a transfer plate under the arming plug pressing down on a belleville spring, which inverts launching the firing pin into the detonator triggering the mine. The mine is fitted with two secondary fuze wells on the side and bottom for anti-handling devices. The M6 and M6A1 variants were fitted with chemical fuzes, the M600 and M601, the later M6A2 used the mechanical M603 fuze. The mines are found in Angola, Cyprus, Korea, Lebanon, Rwanda, Thailand, the Western Sahara (although it they may have been M15 mines that were misidentified).